Currency translation gains/(losses) on the translation of the offshore businesses are as a result of the difference between the weighted average exchange rate used for trading results and the opening and closing exchange rates applied in the statement of financial position. For the year the weaker closing Rand translation rate has increased the Group net asset value. 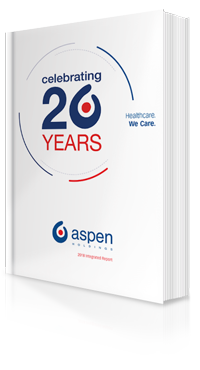 With effect from 12 June 2018, Aspen Pharmacare acquired control of 100% of the share capital of Alphamed for a consideration of R164 million. The estimated post-acquisition operating profits is not material to the Group. Due to Alphamed being a standalone company, incorporating manufacturing and development operations, Aspen is accounting for its acquisition as a business combination. Due to the timing of the transaction Aspen has not yet completed the detailed exercise to identify and value the separately identifiable intangible assets acquired and thereafter the goodwill, if any, arising as a result of the transaction. This will be completed as part of the finalisation of the accounting for the acquisition. Legal ownership of the shares finally transferred to Aspen Pharmacare on 18 September 2018, after the transaction was ratified by the outgoing shareholders following approval of the transaction by the Reserve Bank of India. In May 2017, the European Commission (the "Commission") has instituted an investigation of Aspen Pharmacare Holdings Limited and certain of its indirect wholly owned subsidiaries under Article 102 of the Treaty on the Functioning of the European Union ("Article 102") in respect of the molecules (i) Chlorambucil; (ii) Melphalan; (iii) Mercaptopurine; (iv) Thioguanine; and (v) Busulfan, for (a) alleged setting of unfair and excessive pricing in the form of significant price increases; (b) alleged unfair/abusive negotiating practices; (c) alleged stock allocation strategies designed to reduce supply; and (d) alleged practices hindering parallel trade, in the European Economic Area (excluding Italy). The Commission has confirmed that at this stage it has "no firm conclusions" on whether Aspen Pharmacare Holdings Limited and/or its indirect wholly owned subsidiaries have undertaken any infringement of Article 102 as it requires to complete its investigation. The Commission's decision whether to formally open a case is likely only to be made during the first quarter of 2019 after conclusion of its investigation. The outcome of the Commission matter is unknown and uncertain at this stage and therefore no liability has been raised in the statement of financial position. In October 2017 the UK Competition and Markets ("CMA") opened an investigation of Aspen in respect of alleged anti-competitive conduct and pricing pracrelation to the supply of fludrocortisone acetate 0,1mg tablets and dexamethasone 2mg tablets in the UK. The CMA has subsequently advised that it will not be proceeding with its investigation in relation to the dexamethasone 2mg tablets. A high level of co-operation and diligence is being afforded to the investigation team by Aspen and its advisers. The CMA’s decision whether to formally open a case is only likely to be made by November 2018 after conclusion of its investigation. The outcome of the CMA matter is unknown at this stage and therefore no liability has been raised in the statement of financial position. In the prior year Aspen Global Incorporated ("AGI") acquired the exclusive rights to commercialise the anaesthetics portfolio of AstraZeneca globally (excluding the USA) ("the AZ anaesthetics"). With effect from 1 November 2017, AGI acquired the remaining rights to the intellectual property and manufacturing know-how related to the AZ anaesthetics ("the Residual Rights"). The fair value of the residual rights capitalised to intangible assets in the year was R8 060 million and R5 202 million of consideration has been paid in the current year. The balance of R2 858 million included in other non-current and current liabilities, comprises the present value of future deferred fixed and performance-related milestone payments. Management has determined that this transaction should be treated as a business combination and not as an asset acquisition. Management evaluated whether the transaction resulted in the acquisition of inputs and processes that had the ability to create outputs in addition to those acquired in the previous year (treated as a business combination). Management came to the conclusion that no additional outputs, nor employees, were acquired and therefore treated this transaction as an asset acquisition rather than a business combination.